I’ve been absent for two weeks from GT circulation, thing was I find it hard to paddle through my murky brain about the movies that I would be recommending when I have not seen it, so I’d rather be absent than making up one I didn’t even see. I was tagging along through out their stay (I have lots of pictures but when I moved in my MILs house, I left them at my mom’s house, ang layo kaya ng Cotabato sa Davao, lol). On the last day, she called me inside her room, akala ko may kasalanan ako, instead she handed me this … o diba, surprisingly, pareho kami ng size, 9. Swak! …. 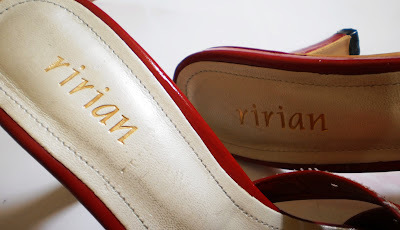 Her name was Princess Ririan and so is the brand of her shoe… wa ako masabi … feeling ko princessa din ako… lol… she thanked me because I wasn’t so intrusive … so as a reward she gave me this and allowed me ask more personal questions, ooohhhhhhh, scoop! But it was too personal that I can’t even take to write it as it would endanger her status as a princess… so wa nalang…. After they left this shoe has serviced all girls in the office, kahit tig-isang oras lang, kahit yung maliit ang paa kaloka …. Medyo nabura na yung pangalan… lol….if you ask if I still have contact with that lady, I don't have anymore, that was the first and the last, and I cannot forget that experience that made me nostalgic. Thus, I’m sharing this post with my friends at Nostalgia at Rose’s blog. Thanks lovelies for dropping by. Wow tVernz, princess shoes? Nice! Kahit one second lang pwede kong isuot din? LOL. wow naman teacher Vernz ^_^ I so love the design!! and knowing na its from your princess friend... wow talaga!! Love ko ang red kasi talaga!!! Uy, size 9 din ako! :) Makikipila ako sa mga makikisuot. Hehehe. wow nice red shoes naman, pero mas win ka while getting in touch with a princess. bongga ka dun! ayay! ang galing naman....pede pa suot pod te...ehehehe! ka bongga man sad kau nimo woi...ehehhehe! 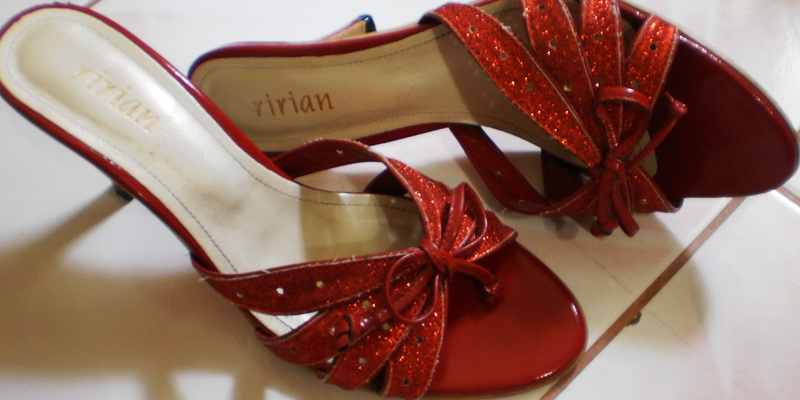 A pair of ruby shoes from a princess? Really? That's is so cool! That pair deserves a major keeping. Hihi. wow.at may history ang red stuff na ito..ang ganda ganda naman... kung 9 lang ako makikipila ko para la-princess din lol..
Oh boy, you can put it in a glass box and preserve it hehehe. wow! girls talk and nostalgia in one. hehe. 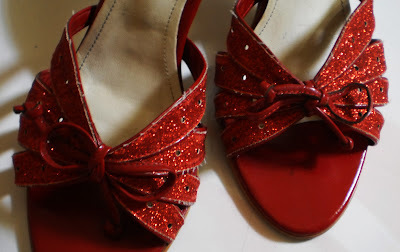 ohh-la-la!I bet those red sandal looks perfect on you,sistah Vherz!di bagay yan sa akin kasi chicken feet ako lol! 2 in 1 pala to. Oy ang ganda ng shoes ha, as in pang princess feet hehehe. size 9 ka? ang laki pala ng paa mo, ang tangkad mo siguro. and tma ka magiging nostalgic ka nga kapag tiningnan mo ang shoes na yan, parang iisipin mong, hmmm! bigay ito ng princess..
wow...kagara kay shoes man sa prinsesa..phulam sad ko be bahalag dako ra kaayo nyahahaha..pareho mo size ug tiil sa ako mother dear hahahaha. Those are so pretty! Has a colorful history as well! Journalism does have great perks, eh?! Happy GT, Vernz!